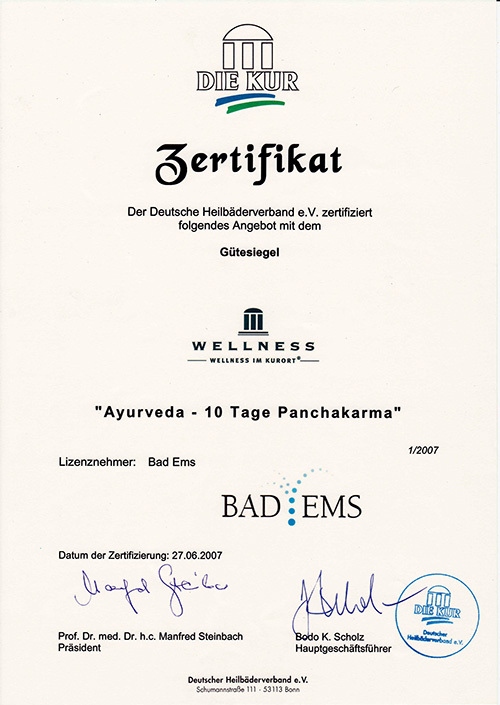 Several programs of the Maharishi Ayurveda Health Centre Bad Ems were honored with the prestigious seal of quality “Wellness at the Health Resort” by the German Health Spa Association (Deutschen Heilbäderverband e. V.), the umbrella organization of the approximately 350 German health resorts. The registered trademark is only granted to selective offerings in the wellness and health tourism industry, which guarantees the highest quality of services. Part of the recommended services are the 10-day Panchakarma program as well as the two- or three-day introductory programs of the Maharishi Ayurveda Health Centre Bad Ems, which are advertised by the city and tourism marketing association Bad Ems (Stadt- und Touristikmarketing Bad Ems e. V.).